With Arrow we were given a TV version of Batman, The Flash could be seen as a TV version of Spider-Man and with DC’s Legends of Tomorrow we are now given The Avengers on TV. Well, not quite but it’s the same sort of idea. There are some notable differences here such as the really obvious one of the team being made up of a collection of supporting characters who were all introduced and developed in shows about other characters. The Avengers was a film that celebrated the coming together of a group of characters who all -mostly- had their own films to establish them whereas this is a group of heroes made up by a collection of spare parts. Is that a bad thing? Not by itself as if the characters are compelling enough then they can easily carry the show and make the whole thing work. There’s a lot of work to do to establish all these different characters and where they fit into this unconventional team dynamic but there is definite potential here. This episode mainly focuses on a new character named Rip Hunter (Arthur Darvill) who pulls together a team of superheroes to bring down the era spanning evil of Vandal Savage (Casper Crump) before he has a chance to conquer the entire planet as we see in the opening scene set in the year 2166. Since Rip is the new character here we spend a lot of time with him establishing his role as a Time Lord Master and his motivation for him bringing this group together. I promise that this will be the last Doctor Who joke I make unless an episode directly references it. To the episode’s credit there isn’t much time wasted in rounding up the team that Rip has chosen and the scenes of him doing so are entertaining. We get a quick yet definitive intro to all of the characters that tells us a little bit about them before moving on to seeing them together. It was very comic book in the way it was structured as I have seen many stories establishing teams do much the same thing. The team chosen are Ray Palmer’s “The Atom” (Brandon Routh), Sara Lance’s White -formerly Black- Canary (Caity Lotz), Jefferson “Jax” Jackson (Franz Drameh) and Professor Martin Stein’s (Victor Garber)’s merged entity Firestorm, Prince Kofu/Carter Hall’s Hawkman (Falk Hentschel), Princess Shayera/Kendra Saunders’ Hawkgirl (Ciara Renée), Leonard Snart’s Captain Cold (Wentworth Miller) and Mick Rory’s Heatwave (Dominic Purcell). That amounts to 8 heroes spread across 9 characters with a tenth when you include Rip Hunter so this could be a bit much for one show. 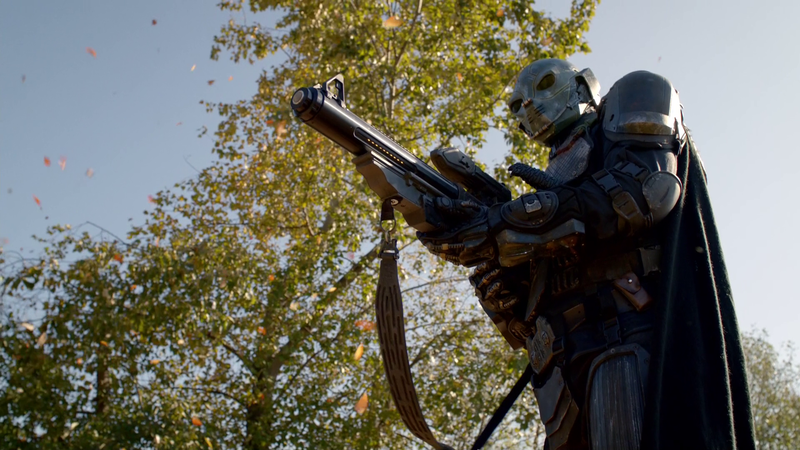 DC’s Legends of Tomorrow has 16 episodes to play with so there’s plenty of time to have certain characters remain the focus while other fade into the background across different episodes. There’s enough diversity in there to have varied interactions and relationships develop between them so I’m not overly concerned at this point. This episode was a little light on character development but the important thing is to get these people together and in later episodes there can be time spent on each of them. The key thing is that this episode be entertaining and at that it succeeds in spades. There are already fun dynamics within the team starting to emerge and everyone gets pretty much the same amount of screen time so we get enough information about the characters to make do for now. Ray and Sara start off better off than the others as they have had so much time over on Arrow to develop before coming onto this show so fans of Arrow will have a head start with these characters. Martin Stein and Captain Cold seems a little more familiar as they had so much time on The Flash. Prior knowledge really isn’t essential here as the narrative cleverly makes the present situation the only thing the audience should care about. Enough background information is given for newcomers to just roll with it and move on from there as long as they are willing to accept that these character exist before the beginning of the show. I like how the episode addresses the fact that these characters are essentially the spare parts by having that be the reason Rip Hunter wanted to recruit them. He has gone rogue from the Time Masters and stolen his ship, The Waverider so that he can recruit the team to stop Savage. He has recruited the team because failure won’t impact the timeline an awful lot. It turns out that history doesn’t recognise any of them as being significant so using them was the least risky outcome. Rip lies to them all when trying to recruit them by saying that they become legends and that they are the only people that could handle it so naturally it comes as quite a shock to everyone when they find out how insignificant they are. Mick Rory isn’t all that bothered but everyone else would rather be remembered for something. Leading the charge on this is Ray Palmer who has a massive inferiority complex that fuels his desire to be remembered for something great. Hearing from someone in the future that he doesn’t make the impact he wanted is tough for him and makes him question every decision he has ever made. This works on a meta level as Brandon Routh is often regarded as the inferior Superman due to the poor performance of Superman Returns -I don’t agree with him being the inferior Superman personally by the way- so having him lead the charge on wanting to leave an impact on history really works with the actor history as well. It’s a bit like Birdman being enhanced by the fact that Michael Keaton is very similar to the character he is playing. Despite his narcissism Ray Palmer never stops being likable due to Brandon Routh’s charismatic performance. There is the suggestion of a fun dynamic between him and Stein who doesn’t remember Palmer being his student. It is revealed that Rip Hunter’s motivation is a very personal one as Savage murdered his wife and child. He has also killed billions of people but if Rip used that as a personal motivation then it could be seen as rattling off a statistic where this makes it personal for his character. He wants to bring down Savage because he took the most important thing in his life. With a character from the far future with lots of fancy tech it’s an easy way to humanise him and make the emotional stakes relatable. Hawkman and Hawkgirl have a personal stake in this too as introduced in The Flash/Arrow crossover episodes from last year (click the show names to read my reviews). This episode reminds viewers -or introduces for those new to this- to their connection to Savage and uses it as a jumping on point for the whole story. Their Egyptian origin becomes the first clue as they head to 1975 to speak to an expert in this story. They go to visit Dr. Aldus Boardman (Peter Francis James) who gives them a significant info dump on Vandal Savage and how he spans history. The reveal that he is actually the son of Hawkman and Hawkgirl in one of their previous lives was an interesting surprise that added a much needed layer of depth to what was otherwise a fairly antiseptic story point. Ciara Renée’s performance was really impressive as she played the conflict of feeling so close to someone that she can’t remember. The fact that her son is a good bit older than her is something that would be hard to get your head around and she shows the complex emotions well. She seems very motherly around him which looks odd considering how young she is compared to him. It just shows how weird this can all get and still be worthwhile. Sara, Mick and Snart make for a fun grouping when they go out drinking in the 70s. Sara’s a heroic character but there’s enough of a mischievous edge to her that she fits in with the Rogues better than the heroes. The bar fight was a lot of fun and helped to ground the insanity of time travel and reincarnation with something tangible that people can understand. In effect Mick is the every man in this situation who can’t understand that the “reruns” on the TV are actually the first broadcast but he can understand getting into a fight. He says that he loves the 70s because the era finally brings him something that is familiar to him. I want to see more of these characters working together as they were a lot of fun. Less effective was the relationship between Jax and Stein. Jax isn’t up for the mission so Stein forces him to come by drugging him. I like this character but this is a really terrible thing for him to do. We don’t know much about Jax other than him eventually coming round to the idea and liking being on a team. 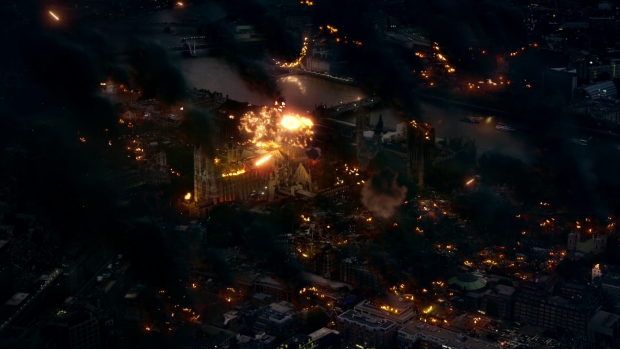 It’s not a good start for the Firestorm duo but hopefully things will improve over the next few episodes. The episode looks incredible. 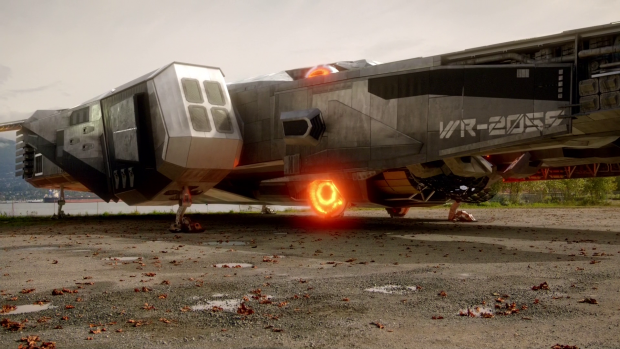 All of the powers are well realised with some excellent visual effects and the design of the Waverider is amazing, both inside and out. This is clearly a very expensive show and it looks great as a result. It’s a shame that the action wasn’t all that exciting when it happened. I like the idea of the time traveling bounty hunter of the name Chronos who is tracking down Rip for betraying the Time Masters. The problem was that he wasn’t featured an awful lot and wasn’t all that interesting. He was definitely formidable and should represent a decent recurring threat to the team but he wasn’t in this episode enough to work as well as he could have. The overt comparison to Boba Fett also doesn’t make up for the similarities though it is fun to have a Star Wars inspired villain fighting them in the 70s. Another thing that doesn’t work is Vandal Savage. The crossover episodes had trouble establishing him as the threat he needs to be and this show so far has the same problem. He is only in two scenes but Casper Crump so far lacks the necessary charisma to put him on a level with the other main antagonists seen in both The Flash and Arrow. This is only the first episode so maybe that will improve as things progress. A solid start to what should amount to being a really fun spinoff from the popular parent shows Arrow and The Flash. 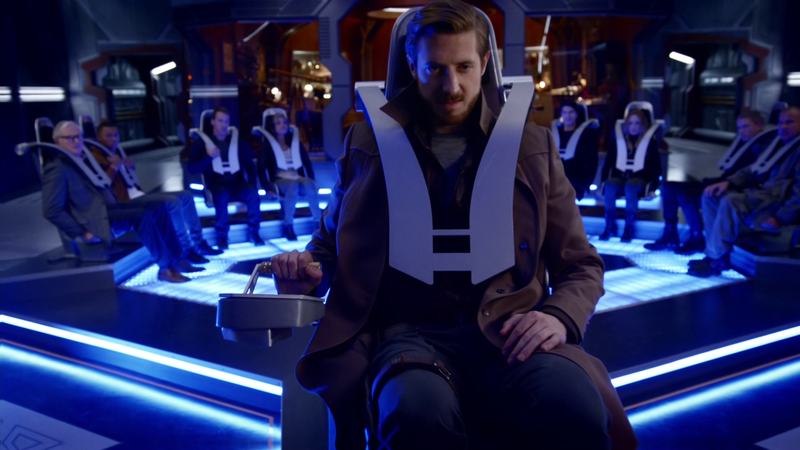 The episode mainly focuses on new character Rip Hunter which makes sense as he is the one that brings these characters together so establishing his role as a Time Master and the stakes involved is a good way to start things off. There isn’t a lot of time wasted in bringing the team together which is good. The introduction to each of the characters is effective in showing a little bit about them before bringing them together. It reminded me of comic books in how it was structured as I have seen other team stories start in much the same way. The episode was a little light on character development but this is fine as the main focus was getting them together as quickly as possible. It’s key that the episode is entertaining and that is where it really succeeds. There are already fun dynamics within the team starting to emerge and everyone gets pretty much the same amount of screen time so we get enough information about the characters to make do for now. Ray and Sara are off to the best start as they were both significant presences on Arrow closely followed by Martin Stein and Captain Cold who featured heavily on The Flash. I like how the episode addresses the fact that these characters are the spare parts from their parent shows by making that the reason that Rip brings them together. They aren’t historically significant so they are more expendable if Rip’s plan doesn’t work. Ray Palmer leads the charge on wanting to change that which works on a meta level considering his history playing the Superman that didn’t work out. Despite his narcissism Ray can’t help but be likable due to Brandon Routh’s charismatic performance. It is revealed that Rip’s motivation is a personal one as he wants to stop Savage after losing his family to him. This cuts through all the time travel complexities and makes this about something very relatable. Hawkman and Hawkgirl also have a personal stake due to their connection to Savage and their Egyptian origin becomes essentially the launching point for the story. The reveal that their source on Savage in 1975 is actually the son of Hawkman and Hawkgirl in a previous life was done really well. Ciara Renée’s performance does a good job of showing how torn she is by feeling motherly towards someone far older than her while being unable to remember him. It looks odd but it really works. 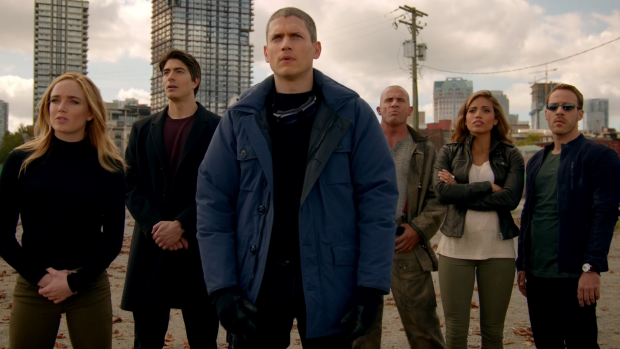 I really liked the bar fight involving Sara, Mick and Snart. The three of them work well together and have a really fun dynamic already. I want to see more of this as the show continues. Jax and Stein’s relationship is far less effective mostly because Stein drugged him to make him come on the mission. I like Stein but this doesn’t paint him in a very good light. There’s plenty of time to redeem that but this isn’t a good start. The time traveling Bounty Hunter Chronos was cool but wasn’t featured an awful lot. He was definitely formidable but felt like something of an afterthought to the story. Similarly Vandal Savage isn’t as threatening or charismatic as he needs to be. It’s only the first episode so might get better as time goes on.